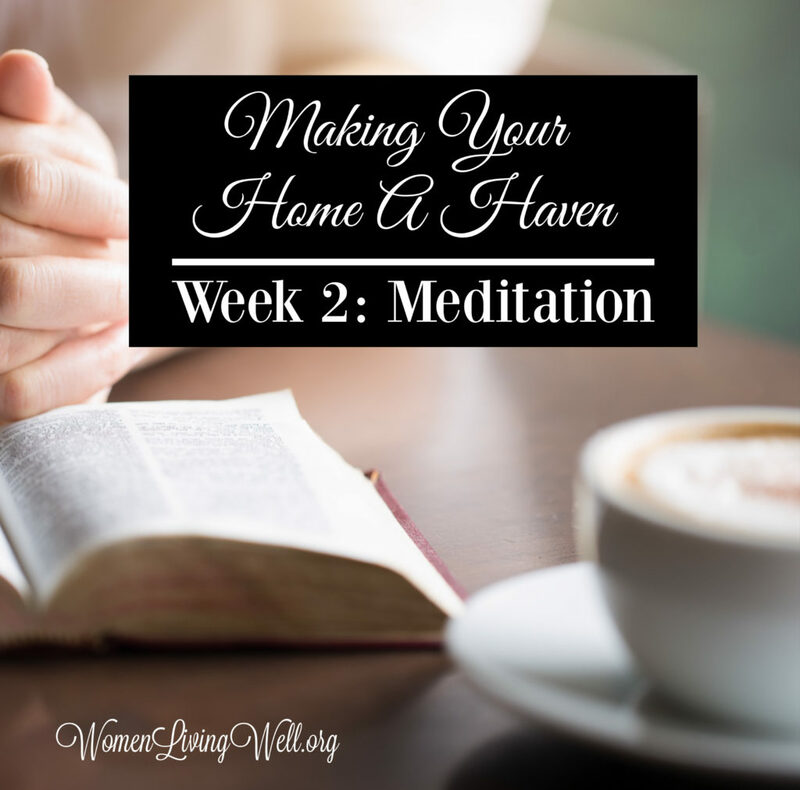 Welcome back to Week 2 of the Making Your Home a Haven Challenge! Keep your candles burning and your thankful heart going and let’s add to it! This week’s Spiritual Focus is Meditation. Some days a scheduled quiet time just can not happen. Emergencies, sicknesses, a busy season at work, or family members who need us, just simply make it impossible. It would be wrong for us to put pressure on ourselves to always create the “Pinterest Perfect” quiet time. Life just does not work that way. So what’s the solution when an extended time alone with the Lord is not possible? Learn how to meditate on God’s Word. Meditating is essentially soaking in God’s Word. Like a sponge, sit and linger over God’s Word. Take in the living water and be refreshed. Meditating goes hand in hand with memorization. If you are memorizing, then most likely you are also meditating. But it is possible to meditate and not memorize. 1. Choose the passage of Scripture for the week. My favorite passages to meditate on come from Psalms, Proverbs and the Gospels. 2. Write the passage on a note card and slip it in your pocket. Pull it out periodically and read over it. Keep it in your purse all week long, and pull it out at convenient times and read through it. 3. Open your Bible to that passage, and place it on the kitchen counter. All day long, when you walk through the kitchen, pause, read the passage, and then move on. 4. Read the passage out loud. Read it to yourself, and read it to the children during breakfast and lunchtime. 5. Read the passage first thing in the morning. Read the pas- sage as soon as you get out of bed so it’s the first thing on your mind that morning. 7. Write the verses at the top of your to-do list. This way, every time you look over your to-do list, you can review the Scripture passage. Squeeze every drip of nourishment out of the passage all day long through these short readings of Scripture. Meditate on God’s Word day and night, and you will soon find your life transformed by the renewing of your mind! So pause right now and consider…what passage of scripture would you like to meditate on this week? You could choose an entire chapter – like I love Psalm 46 – the entire chapter. Or you could choose individual verses on a topic that you are struggling with. Most of these blog posts have a printable with the verses. You could print multiple copies and place them around your house and read them over and over this week. God’s Word is alive and powerful! I know He is going to move in your life and speak to you – as you meditate on His Word! Keep your candle going and add to it – soft music everyday in your home. Choose worship, classical, jazz, or another form of peaceful music that you enjoy. Focus on good, peaceful and true thoughts and let the frustrations of this world go. Rest and release all of your worries to the Lord. Burning candles and soft music –change the atmosphere of the home. While the rest of my home may be messy – my candles keep on burning and my soft music…keeps on playing. Morning, noon and night they serve me. My candle serves me with a flickering warm light, a pleasant scent, and a reminder to turn to God as my source of strength and help. My music serves me with a soothing sound. They don’t make messes, they don’t need managed, they just simply bless me and my family. **Share with us in the comment section – what passage of scripture have you chosen to meditate on this week and what is your favorite music to play in your home? Philippians 4:6-7. What a blessing this is for me this week as I am facing surgery on Friday. What a delight the candle and music will be to me and my family during my recovery. Thank you. This is the verse I will be meditating over this week. Plus it seems appropriate since this week’s challenge has to do with music! Amazing how God works! I guess IN arms length is a better way to put it. I’m memorizing and meditating on John 15:1-4. I’m playing Bluegrass Gospel on Pandora. Excited for this week’s challenge! My verse to meditate on is Psalm 46:10. This is a verse that is and has been very important to me for 10 years. It reminds to be still-let God talk. NO matter what is going on, I need to hear his voice in my life. I wanted to share how this reminded me of a time when I was going through a rough period weaning off of pain medication. I had Post-its of uplifting, encouraging promises from God all over my house. It really helped get me through. I’ll pray and go pick a scripture or chapter to meditate on now. God bless you ladies. I am in the waiting room of life right now. I am working on Being Still and waiting in my God. Courtney, thank you so much for the printables! I’m meditating on Ps. 46 especially vs. 1 with sweet light classical music. About 6 months ago I discovered a man on YouTube (DappyTKeys worship music) who plays worship songs on the piano. His music has been such a blessing to me. “My grace is all you need, for my power is greatest when you are weak”……. Thank you for continuing this each year. Thankful for His steadfast love and faithfulness!! ” Wisdom will save you form the ways of wicked men, from men who’s words are perverse, who leave the straight paths to walk in dark ways, who delight in doing wrong and rejoice in the perverseness of evil, whose paths are crooked, and who are devious in their ways. I can rest in Him because He is my shield, protector and most of my Kinsmen-Redeemer. I’m reminded he will avenge me against my enemies. I pray many blessings to Courtney and her family, and to each and everyone of you, I pray God keep you in His perfect peace. Amen. I'm sorry for your heart hurting.